Dear readers, please note that this is the old website of maxEmbedded. The articles are now no longer supported, updated and maintained. Please visit the new website here and search for this post. Alternatively, you can remove .wordpress from the address bar to reach the new location. Example: If the website address is http://maxEmbedded.wordpress.com/contact/, then removing .wordpress from it will become http://maxEmbedded.com/contact/. We apologize for the inconvenience. We just want to give you a better viewing and learning experience! Thanks! This article is in continuation with the previous PWM post. Learn how to program the timers to operate in PWM mode! So let’s begin! PWM stands for Pulse Width Modulation. It can be generated by comparing predetermined waveform with a reference voltage level or by making simple analog circuits. 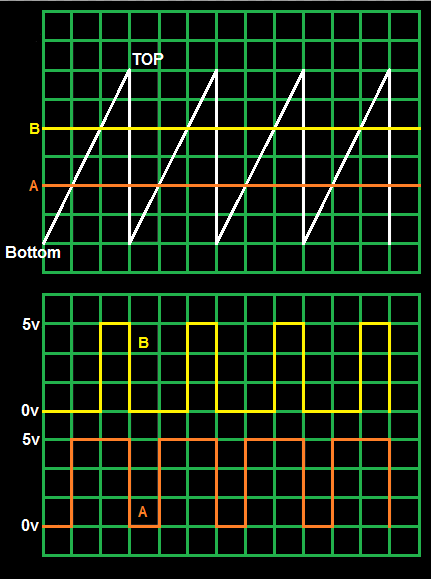 Duty Cycle of a PWM waveform is given by the following relation. How to choose timer, operation mode and compare output mode for generating the desired PWM. So now, without much hassle, let’s see how to implement it using the AVR microcontrollers. Before we proceed, I suggest you to go through my previous posts on Timers and PWM. Let us take a problem statement. We need to generate a 50 Hz PWM signal having 45% duty cycle. Okay, so I won’t be writing any code here (just the pseudo code). I assume that after reading my previous posts, you are smart enough to write one yourself! We will discuss only the concepts. Firstly, choose a suitable timer. For this application, we can choose any of the three timers available in ATMEGA32. Choose a suitable prescaler. Then set up the timer and proceed as usual. The catch lies here is that you need to update the compare value of OCRx register everytime. One such way is discussed in the pseudo code given below. This is analogous to the traditional LED flasher, except the fact that the on and off times are different. UPDATE: One of the readers of maxEmbedded, “coolpales” has written this code, and it worked for him. Okay, so now lets learn about the PWM mode. The PWM Mode in AVR is hardware controlled. This means that everything, by everything I mean “everything”, is done by the AVR CPU. All you need to do is to initialize and start the timer, and set the duty cycle! Cool, eh?! Let’s learn how! Here, I have used Timer0 of ATMEGA32 for demonstration. You can choose any other other timer or AVR microcontroller as well. Now let’s have a look at the registers. We have come across this register in my Timer0 tutorial. Here, we will learn how to set appropriate bits to run the timer in PWM mode. We will discuss only those bits which are of interest to us now. Bit 6,3 – WGM01:0 – Waveform Generation Mode – These bits can be set to either “00” or “01” depending upon the type of PWM you want to generate. Here’s the look up table. Bit 5,4 – COM01:0 – Compare Match Output Mode – These bits are set in order to control the behavior of Output Compare pin (OC0, pin 4 in ATMEGA32) in accordance with the WGM01:0 bits. The following look up table determine the operations of OC0 pin for Fast PWM mode. Now lets have a look at the Fast PWM waveforms. Detailed explanation can be found in my previous tutorial. Now let me remind you that the AVR PWM is fully hardware controlled, which means that even the timer compare operation is done by the AVR CPU. All we need to do is to tell the CPU what to do once a match occurs. The COM01:0 pins come into play here. We see that by setting it to “10” or “11”, the output pin OC0 is either set or cleared (in other words, it determines whether the PWM is in inverted mode, or in non-inverted mode). 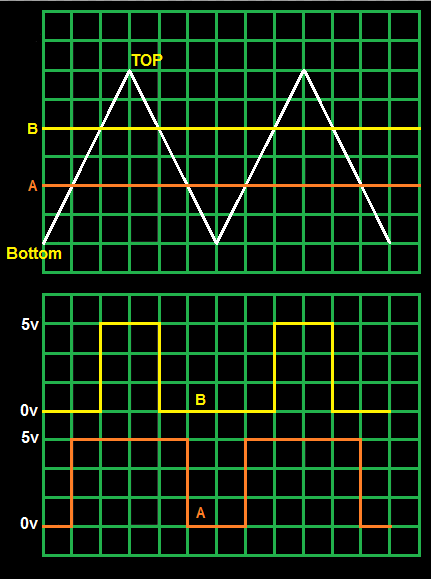 Similarly for Phase Correct PWM, the look up table and the waveforms go like this. Even here, setting COM01:0 to “10” or “11” determines the behavior of OC0 pin. As shown in the waveforms, there are two instances – one during up-counting, and other during down-counting. The behavior is clearly described in the look up table. Please note that OC0 is an output pin. Thus, the effects of WGM and COM won’t come into play unless the DDRx register is set properly. Refer this tutorial for more info. Bit 2:0 – CS02:0 – Clock Select Bits – These bits are already discussed in Timer0 tutorial. The following code discusses how to create a PWM signal of a desired duty cycle. If you wish to change its frequency, you need to alter the TOP value, which can be done using the ICRx register (which is not supported by 8-bit timers). For 16-bit Timer1, it can be varied using ICR1A. I will discuss about this soon when we discuss about servo control. So here goes the code. To learn about I/O port operations in AVR, view this. To know about bit manipulations, view this. To learn how to use AVR Studio 5, view this. To learn how this code is structured, view the previous TIMER0 post. So now, let’s take another problem statement. This one is going to be a more of a practical stuff unlike the previous one! Let’s take the traditional LED flasher where we need to blink an LED at a particular frequency. But hey, wait, didn’t we discuss it long back in this post (scroll down towards the end)? Hmm, so let’s modify it so as to incorporate PWM. Unlike the traditional LED flasher (where LEDs are either ON or OFF), lets make it glow at the maximum brightness, and then slowly decrease its brightness till it reaches zero, and then again increase its brightness slowly till it becomes maximum. So how do we do it? Yes, you guessed it right! Decrease the duty cycle slowly from 255 to zero, and then increase it from zero to 255. Depending upon the duty cycle, the voltage applied to the LED varies, and thus the brightness. The following formula gives the relation between voltage and duty cycle. So here goes the code. I won’t explain it, you can decode it yourself. To learn about I/O port operations in AVR, view this. To know about bit manipulations, view this. To learn how to use AVR Studio 5, view this. To learn how this code is structured, view the previous TIMER0 post. And yeah, if you have any suggestions, doubts, constructive criticisms, etc, you are most welcome to drop a note below! Subscribe to my blog or grab the RSS Feeds to stay updated! Great job!!! Thanks for your time and for sharing you knowledge. These pages were very useful for me. Using Timer0 PWM Mode , The Required time period of the pulse to be generated is 20ms Timer0 is pre-scaled to 0 and 255 counts will give us a time period of 16 micro-seconds. If we do pre-scale Tmer0 to 1024 the max. time period we can get is 16 milliseconds. I am thing of controlling the moving the servo to various position using Timer0 . servo requires 20ms compulsory . Servos cannot be controlled using Timer0, since it is 8 bit timer and will give you very low resolution. Try using the 16 bit Timer1 for this purpose. I want to change this code to ATmega1280. sir plz can u explain me the concept of _delay_loop_2() .. how to use in for loop to get some appproximate delay in program execution?? Delay loop using a 16-bit counter __count, so up to 65536 iterations are possible. (The value 65536 would have to be passed as 0.) The loop executes four CPU cycles per iteration, not including the overhead the compiler requires to setup the counter register pair. Thus, at a CPU speed of 1 MHz, delays of up to about 262.1 milliseconds can be achieved. Try looking up the nongnu documentation here. sir, how to find out the relation between pulse width and servo angle for a particular servo.. m having a vigor VS-2 servo..? Usually the pulse width is in the range of 600us to 2100us for an angle of 0 degrees through 180 degrees. However the exact value depends upon the servo. I would suggest to go for hit and trial method. You already know this range, now use hit and trail to determine the exact value. Its a very nice question. The answer to your question is Yes. independent of other timer interrupts. So you can use the all the timers at the same time. Although I could not find the tutorial for servo control. Can you upload it ? Hey guys, I want to change the TOP value of timer 1, 10 bit PWM to be lower to get a frequency of 20KHz for my DC motor, I know we need to use something like input capture but I have no idea how to use it, can someone help me? Atmega datasheet states that frequency of the PWM equals f_pwm=(f_cpu)/(256*prescaler), so with 1MHz internal clock and no prescaler f_pwm = 3906Hz. The datasheet states Frequency of PWM= f(clock)/(prescaler*(1+TOP)). Since TOP is variable as according to the PWM Mode one is using, and also the value one sets in the OCRx or ICRx, so you can get the desired frequency. The one you are talking about is when TOP is 0xFF. Can we have at output also variable voltage ex. 1-12V? Can you advice how to do it? I didn’t get you. Do you want a variable output range of 1-12 volts from the microcontroller? Okay, so here is something I want you to try. Generate a PWM signal at one of the pins of the microcontroller, and then take a multimeter/voltmeter and measure the voltage at that pin wrt GND. What do you observe? You’ll observe that the voltage varies in between VCC and GND. The multimeter shows the average voltage at that point. If you want voltage as high as 12v, then you must connect a driver or relay at the output of the PWM pin. Check out this post where we have connected a motor driver to get a 12v output. You can use a similar setup if you want. You can also replace the motor driver with a 12v relay. It will give you a variable output in the range of GND and +12v. when driving a DC motor, should one use fast PWM or phase correct PWM? It doesn’t matter as far as driving DC motors is concerned. please do a blog on pwm using 16-bit atmega timer. If you have followed all my timer tutorials, you shouldn’t have trouble writing the code yourself. You don’t need to worry about generating the sawtooth waveform, comparison and waveform generation. Simply follow my tutorial and specify the desired duty cycle. All these things happen internally and you get the desired waveform directly.